Compilation discs are a fact of life to today's CD buyers. You either love 'em, or you just try to ignore 'em. Personally I seldom even look at them. 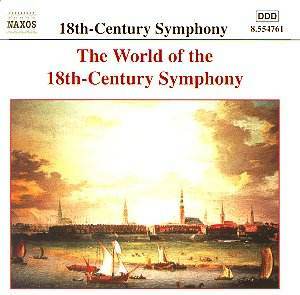 However, this Naxos offering under the title "The World of the 18th-Century Symphony" is a little bit different. It has a commercial aim, naturally enough, but one that music lovers might well like to be made aware of and to support in the future if they are not aware of it already. Naxos intends to trawl what it sees and hopes to be a rich vein of untapped music - namely the Eighteenth Century. In conjunction with a New Zealand publishing house, Artaria Editions, which has in its list scores for eight of the ten works on this disc ( not the C.P.E or J.C.Bach Symphonies) it plans to seek out and market some of the mass of material available from that period which we music lovers in general do not know. No-one would dispute that Naxos knows its business. This is typified by the comprehensive and highly informative notes with the disc written by Dr. Allan Bradley. Amongst the information Dr. Bradley gives us is the frankly staggering figure of over 16000 Symphonies from the Century, that he tells us have been identified to date. The mind boggles. Obviously a large proportion will be unknown because the sorting out that posterity has made already will be proved to be right, but if just one percent even proves to be good enough to be repertoire of the future that is still a lot of music new to us. I would not normally refer to the notes supplied with a disc as liberally as on this occasion, but this is that sort of CD. Dr. Bradley makes a good point. He reminds us that in their time Mozart and Haydn had contemporaries who were equally highly regarded and that re-listening to some of these forgotten names might prove a valuable experience. He then goes on to describe the fragmentation by styles of European music at the time. Of the items on the disc itself, the pieces are divided into five groupings, the Mannheim grouping, two of J.S.Bach's sons and the disparate music they wrote, the then' Viennese School', and a single piece to represent the music from Stockholm in the late 1770's. The disc has three complete works and the rest are single movement extracts. As is normal with compilations, all the tracks are from previously released recordings from the current listings, and being Naxos, they are of course all new digital recordings. The composers we today associate with Mannheim had helped to build up an exceptionally good orchestra at the Court there. Those original players built up a repertoire full of demonstrations of technical skills and audience pleasing stylistic traits. Stamitz is probably the best known name from that era and he is featured along with three other representatives, and the single movement of his work shows off the local speciality, the crescendo. Another effect featured is the colourfully named Mannheim Rocket - a rising triadic figure (you all knew that, of course, didn't you?) - included in the Gossec extract. The Franz Beck and Cannabich movements belong to this grouping. A complete work by each shows differences between the styles of C.P.E. Bach and his brother Johann Christian. The former's highly personal use of abrupt stops is noticeable and the 'Italianate' approach of his brother - lighter, more airy instantly appeals. The Viennese School of its day felt that the Symphony as a form had a future without what they saw as orchestral gimmicks. Haydn and his contemporaries were proved right, of course, represented here on disc by Dittersdorf, Hofman and Vanhal. The Hofman symphony (complete) is a charming 3 movement piece (from the man credited with the first four movement symphony) while the extracts from von Dittersdorf and Vanhal each has some interest. A single movement by Joseph Martin Kraus - chosen to reflect the influence of the Court of Gustav 3rd in Stockholm - is notable for its solo violin part - nearing what we might now think of as a concerto. Altogether an interesting disc prelude to a series that one can only wish well.